Santa Cruz has a ton of options for pizza and Italian cuisine lovers and you can get everything from a standard slice of greasy goodness to a artisanal pizzas made in wood-fired ovens. With apologies to those left off this list, here are the best places to get a slice or pie in Santa Cruz. 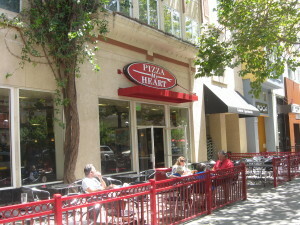 Pizza My Heart – If you like thin crust pizza, this is the place for you. A no-frills pizza joint with locations from downtown to Capitola (and beyond), it’s hard to beat a good slice from Pizza My Heart. Most locations have a distinctly local feel to them, from the surf-themed downtown location to the hole-in-the-wall location in Capitola Village. The slices are greasy in the best way possible and the lines are usually long so pack your patience if you’re hankering for a unique slice. Woodstock’s Pizza – Woodstock Pizza is more akin to a sports and pizza place. They have multiple TVs that always have sports on, a small arcade, and they host local trivia and game nights. Woodstock’s is popular with university students and locals alike, offering a bit more of an “experience” than some other places–think pizza parties and family friendly fun (and beer). Engfer Pizza Works – Engfer’s is a local joint in the Seabright neighborhood that has a quirky appeal. Aside from delicious pies made in a wood-fired oven, they also have a beer cooler from which you can buy drinks for your meal, or grab some to go. There’s a small side room that also has a ping-pong table for guests to use. Bantam Pizzeria – A higher-end pizzeria, Bantam also makes pies in a wood-fired oven from their location on the Westside of Santa Cruz. They have limited hours, typically from 5 p.m. to 9 p.m. Their emphasis is on artisanal pizzas made with organic and locally sourced ingredients, both of which shine through in the great flavors of their pizza. Upper Crust Pizza & Pasta – Upper Crust has what is probably the best Sicilian style pizza you’ll find in Santa Cruz. They are also known locally for having one of the best daily lunch specials in town, as well as their nightly dinner specials, which include pasta, pizza, drinks, and wings. Upper Crust has locations on Soquel Dr. and on Mission St. on the Westside of town. Pizzeria Avanti – Avanti is more similar to Bantam than the other restaurants on this list. They also focus on organic, natural ingredients that sourced from throughout the county. Their offerings are more along artisanal lines, which means the cost is a bit higher than you’ll find at a standard pizza-by-the-slice place. They also have some interesting toppings that you might not find at other places in town.